A com­pre­hen­sive analy­sis of the cru­cial role Air pow­er will play in a Lim­it­ed War against a nuclear back­drop in South Asia. There is a need to switch from deter­rence by denial to deter­rence by Pun­ish­ment in the Indi­an Con­text. Deter­rence by Pun­ish­ment can be done much bet­ter by Air Pow­er and even by Sea Pow­er. Air pow­er is pre­cise, focused and flex­i­ble. It is most con­ducive to retain­ing esca­la­tion dom­i­nance and can set the stage for a Lim­it­ed War designed to steeply raise costs for the Aggres­sor and bring to bat­tle and seri­ous­ly degrade his oper­a­tional and Strate­gic reserves prefer­ably in his own ter­ri­to­ry. India will there­fore have to evolve and enun­ci­ate a Lim­it­ed War Doc­trine that exploits the cur­rent RMA by giv­ing pri­ma­cy to Air Pow­er to be the first respon­ders and if need­ed, set the stage for a wider Air-Land Bat­tle designed to sharply esca­late costs for the Ene­my. Post nucleari­sa­tion the South Asian geo-strate­gic sce­nario has been shaped by what Chris Gagne calls the “Sta­bil­i­ty-Insta­bil­i­ty Para­dox”. Sta­bil­i­ty at the Nuclear lev­el has been off­set by increas­ing insta­bil­i­ty at the sub-con­ven­tion­al lev­el of con­flict. There has been a con­comi­tant sharp down­turn in the use of Con­ven­tion­al Mil­i­tary Force as is evi­dent from the force usage pro­file of India giv­en below. This his­togram indi­cates the num­ber of Divi­sions employed by India in each con­flict after Inde­pen­dence. Thus from 1947 to 1962 the Indi­an Mil­i­tary usage was con­fined to the tac­ti­cal lev­el of 2–3 Divi­sions alone. How­ev­er Air pow­er played a sig­nif­i­cant role in Jam­mu and Kash­mir, Hyder­abad and Goa oper­a­tions. Trag­i­cal­ly offen­sive Air sup­port was eschewed in the 1962 War against Chi­na though exten­sive air trans­port and logis­tics sup­port was pro­vid­ed. 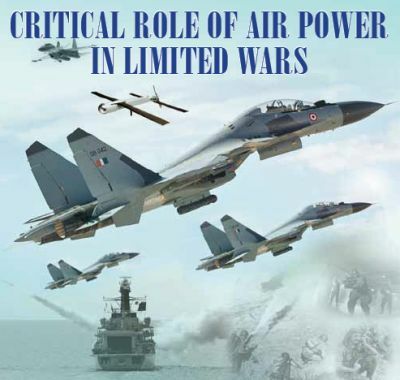 With the 1965 War the Indi­an Armed Forces grad­u­at­ed to the lev­el of oper­a­tional Art via use of 12 Divi­sions in com­bat and vir­tu­al­ly the entire West­ern Com­mand of the Air Force with rein­force­ment from oth­er the­atres also employed. Though this war was a stale­mate it was a high­ly use­ful learn­ing expe­ri­ence. It was with the 1971 War for the Lib­er­a­tion of Bangladesh that the Indi­an Armed Forces grad­u­at­ed to the lev­el of con­duct­ing a Qua­si total war. 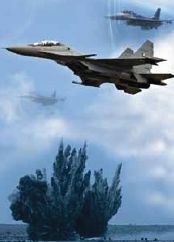 The Indi­an Air force gained Air Suprema­cy over Bangladesh. It massed effects and induced shock and awe. It paved the way for a deci­sive war with spec­tac­u­lar results. A deci­sive war in the Post World War II con­text is char­ac­terised by the abil­i­ty to march on the adver­sary nation­al cap­i­tal and enforce regime change. This is pre­cise­ly what was done. A new coun­try was cre­at­ed with the force of arms and over 93,000 pris­on­ers of war were tak­en. This spec­tac­u­lar vic­to­ry marks the apogee of Indi­an Mil­i­tary Pow­er in the post-Inde­pen­dence era. 1987 saw the onset of recessed deter­rence and a sharp cur­tail­ment in the use of con­ven­tion­al mil­i­tary force. The eco­nom­ic set­back of 1990 there­after severe­ly con­strained response options and from the decade of the 1980s till today — India com­plete­ly sur­ren­dered the strate­gic and tac­ti­cal ini­tia­tive to Pak­istan. Pakistan’s ISI waged an asym­met­ric war first in Pun­jab and then in Jam­mu and Kash­mir. India’s response was reac­tive and pure­ly defen­sive in nature and strict­ly con­fined to its own ter­ri­to­ry. 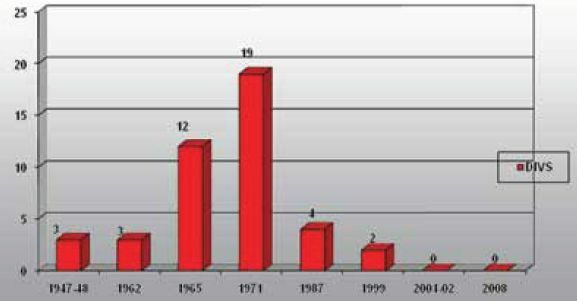 1998 saw overt nucleari­sa­tion and that marked a par­a­digm shift in South Asia. It gen­er­at­ed hubris in Pak­istan and led to the Kargil Intru­sion — a hybrid war response that clear­ly marked a new thresh­old in Pakistan’s asym­met­ric war against India. Indi­an response was inno­v­a­tive but con­fined to the tac­ti­cal lev­el of two Divi­sions sup­port­ed by Air Pow­er but con­fined to our side of the LC. This was a Lim­it­ed War high­ly localised in space but extend­ed in time to almost three months of attri­tion and direct frontal assaults in the moun­tains. This was fol­lowed by the Ter­ror­ist attack on India’s Par­lia­ment and our mobil­i­sa­tion for War in terms of Op Parakram. The flaw was the ‘all or noth­ing’ nature of this deploy­ment. No com­bat took place and the coer­cive effect of this mobil­i­sa­tion wore off over time. This gen­er­at­ed con­sid­er­able angst and the Indi­an Army came up with the Cold Start Doc­trine of attack from the Line of March to make shal­low pen­e­tra­tions all along the West­ern Front. Cold Start suf­fered from seri­ous con­cep­tu­al flaws. The Polit­i­cal Mas­ters and oth­er two Ser­vices were not tak­en on board. The use of land forces to ini­ti­ate con­flict would gen­er­ate tremen­dous fog of war and could break­down esca­la­tion con­trol. Land forces once launched can­not be eas­i­ly dis­en­gaged / called back. Shal­low pen­e­tra­tions are half-baked con­ven­tion­al response options. What if the ene­my reacts with full fledged Strike Corps offen­sives in response to divi­sion­al sized thrusts? There is a need to switch from deter­rence by denial to deter­rence by Pun­ish­ment in the Indi­an Con­text. Deter­rence by Pun­ish­ment can be done much bet­ter by Air Pow­er and even by Sea Pow­er. Air pow­er is pre­cise, focused and flex­i­ble. It is most con­ducive to retain­ing esca­la­tion dom­i­nance and can set the stage for a Lim­it­ed War designed to steeply raise costs for the Aggres­sor and bring to bat­tle and seri­ous­ly degrade his oper­a­tional and Strate­gic reserves prefer­ably in his own ter­ri­to­ry. This would actu­alise deter­rence by pun­ish­ment. The response to asym­met­ric ter­ror­ist strikes is far bet­ter ini­ti­at­ed by Air Pow­er which tar­get in a pre­cise and pro­por­tion­ate man­ner those ter­ror­ist facil­i­ties, camps and infra­struc­ture used to ini­ti­ate the attack. This would make our response just and pro­por­tion­ate. Any ene­my retal­i­a­tion / response would then jus­ti­fy our grad­u­a­tion upwards on the esca­la­tion lad­der. A good mod­el for such a cam­paign is the Israeli Air Forces dec­i­ma­tion of the Syr­i­an Air Force in the inva­sion of Lebanon in 1982. This would set the stage for a Lim­it­ed War in the Air-Land Bat­tle for­mat — to steeply raise costs for Pak­istan for its asym­met­ric adven­tur­ism. India will there­fore have to evolve and enun­ci­ate a Lim­it­ed War Doc­trine that exploits the cur­rent RMA by giv­ing pri­ma­cy to Air Pow­er to be the first respon­ders and if need­ed, set the stage for a wider Air-Land Bat­tle designed to sharply esca­late costs for the Ene­my. There was con­sid­er­able dis­cus­sion on the con­cept of Lim­it­ed War in the wake of the Kargil oper­a­tions. This debate was ini­ti­at­ed by Air Cmde Jasjit Singh (then the Direc­tor IDSA). Sig­nif­i­cant con­tri­bu­tions were made by the then Army Chief Gen Ved Malik and the then Rak­sha Mantri Mr George Fer­nan­dez. Sur­pris­ing­ly with­in three years — this debate had died out alto­geth­er and this very wel­come ini­tia­tive was not tak­en for­ward. There is a con­sid­er­able body of lit­er­a­ture avail­able in the West on Lim­it­ed Wars against a Nuclear Back­drop. Korea was the First such Lim­it­ed War and last­ed some three years. The Chi­nese threw in almost a mil­lion troops and fought the US to a stand­still. The US suf­fered over 1,37,000 sol­diers killed in this Lim­it­ed War where the Chi­nese com­plete­ly ignored the nuclear thresh­old. Gen Mac Arthur was sacked when he asked for the use of atom­ic weapons against the Chi­nese. Bernard Brodie and William Kauf­man were the chief the­o­rists of lim­it­ed war. Kauf­man used the expe­ri­ence of the Kore­an war to the­o­rise about nuclear thresh­olds and red­lines. He iden­ti­fied the pri­ma­ry Lim­i­ta­tion as the non-use of nuclear weapons. The Cuban Con­flict val­i­dat­ed his the­o­ries and helped Amer­i­ca tran­si­tion from mas­sive response to flex­i­ble response. The Viet­nam war was the sec­ond form of con­flict to break­out in a back­drop of nuclear sym­me­try. Though classed as Low inten­si­ty Con­flict it saw the US deploy 5,49,000 troops and launch a mas­sive air cam­paign (Op Rolling Thun­der) against North Viet­nam. Hen­ery Kissinger tried to pop­u­larise the con­cept of a Lim­it­ed Nuclear War but this hard­ly car­ried con­vic­tion and was nev­er put to the test.